Computational fluid dynamic (CFD) codes has been applied to analyze the thermal-hydraulic behavior in the active part of a spallation target. Figure 1 shows the temperature and velocity profiles in the lower part of the XADS target under steady state conditions with the maximum beam current of 6 mA. The maximum window temperature occurs in the centre of the window and is about 510oC. The maximum velocity occurs inside the funnel and is about 1.2 m/s. 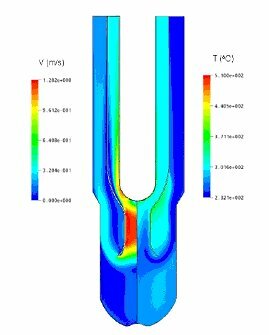 Both the maximum window temperature and the maximum LBE velocity are well below the design limits, which are 525°C and 2.0 m/s, respectively.